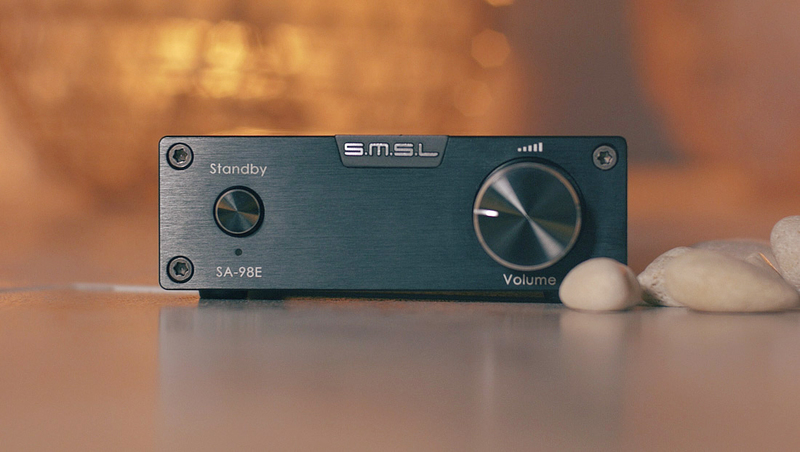 SMSL SA-98E. The big power. Do you need so much? Let’s be honest. When people think about an amplifier even for a desktop setup they usually don’t think about this kind of product. There are two groups of people. One group goes naturally after those commercial product with a lot of marketing behind it and brands as Marantz, Onkyo, Denon, Sony and if it’s for a desktop we look after also those more known. These brands or most of them have amazing products indeed but mostly in the higher more costly range of their product line up. Meaning you have to really pay for all than engineering and also the marketing. You buy the brand’s history with it. You trust as a consumer to the brand, reviews from known magazines and believe it will work and will give you exactly what you are expecting from it. Then there is another group of people from audiophile world which would never even look at this kind of amplifier I am reviewing now as it is a class D amplifier and they would just turned around when find out. But nowadays even big brands use class D amplifiers in some of their products and not just in the completely cheap ones. So for whom is this amplifier build for? This amplifier is meant for a third group of people. For those who want a power and can’t afford this kind of power it delivers from bigger audiophile brands. This amplifier is for those who can't afford this kind of power it delivers from bigger well known brands. The build of this amplifier as the form and dimensions are similar to previously tested Sanskrit 6th from SMSL as it’s from the same line up of product SMSL offers and had been build in the same year I guess. But not necessarily meant with a need to pair them together but as you can see from pictures there was the intention. And I have to say it looks great together and I think better then their Panda series from SMSL. But that is just my personal opinion. The main feature of its amplifier is obviously the claimed big power. 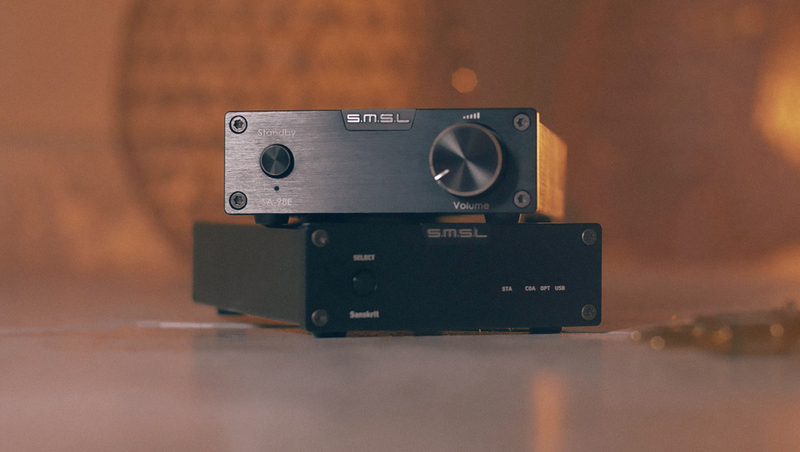 There are no fancy other additional features as balance, bass and treble knobs but that is something you just don’t want and you will never think of if you are on an audiophile journey in your life. So I am fine with it. Connection possibilities are here also pretty straight forward and simple. 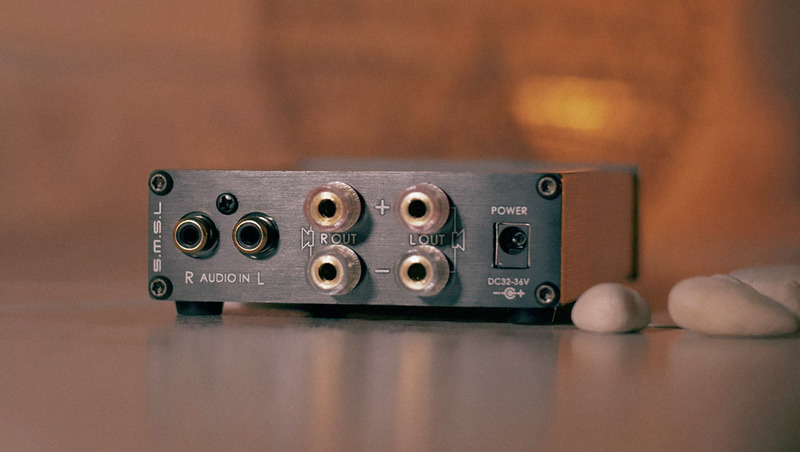 One RCAs in – gold plated but interestingly black no usual red and white and these are the only inputs you have so definitely this amp is meant to work with a DAC unit or pre amplifier which will take care of you source inputs. Speaker connectors-terminals are a bit on a tiny side and as you can see in the video review you will definitely need banana plugs as yes there is an option to connect your speakers just with an wire but the screws are really small and could not take in a usual way the thickness of my speaker wire i tested it with. On the front panel you have a big analog volume knob with blue LED behind which lights up when its on and another LED bellow the ON/OFF button which changes from green to red when it’s on. That’s it. Simple. Inside. Well as already mentioned this is a class D amplifier which uses ST Microelectronics TDA7948E as its core with an efficiency of 85% . PANASONIC ERO film capacitors and ALPS potentiometer. One analogue input. Speaker cable terminals are quite small for thick cables. I recommend to use with banana plugs only. 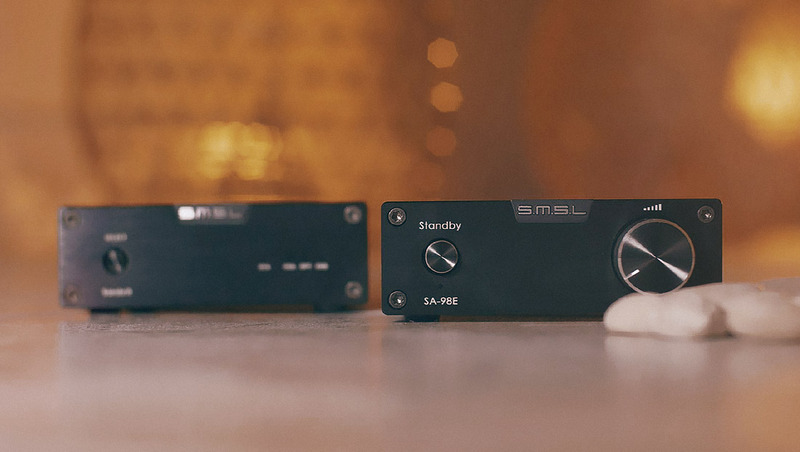 SMSL claims it’s power to 160W per channel per 4ohms. But with as it goes with these amplifiers with a big distortion at the end of its power. (Huge 10 percent) Which is a really a lot and that gets me to the point why you need this big power if you are looking for an affordable amplifier. As with most amplifiers everyone tells you one thing. Never go after half or 2 o’clock of it’s volume scale as there is the distortion more and more noticeable. I tested this amplifier with Warfdale Diamonds 220 and KEF LS50. Diamonds are 8 ohms with 86db of sensitivity and KEFs are 85db and I never needed to reach more that 9 or ten o’clock on it’s volume knob to make it really really loud. For normal listening experience I was listening it its 7 o’clock just fine. And at these levels its very clean with any noticeable distortion at all. So why would you need so much power you can say if you will be using its 15, 20 percent? Well I have learned on my life audiophile journey that with amplifiers and speakers it is not just about the watts. In other word it is not watt as watt. Compare for example an amplifier from same old times with today’s amplifiers claiming the same number of watts and you will find out the difference. Plus with the speakers it is again not so simple and you can feel when you for example connect those mentioned speakers I have tested it with that these kind of speakers need a big power which doesn’t mean you can not feed them with a 50w amplifier you can and they sound ok. Best when you connect them to a strong amplifier the sound is different and you can hear it immediately without a need to make it sound loud the energy and agileness it there in every song you listen to. So I always recommend overkill then underkill. Sound signature of this amplifier is claimed to be warm due its Panasonic capacitors but I really didn’t find it that way. It was more from cold to neutral depends how you pair it with other components. I know someone will be shocked I tested this 100 dollars amplifier with 1000 dollars KEFs but I did it on a purpose for my another article and possibly a video telling you about how the sound can differ depending on the pairing of the components. Plus I wanted to hear how it can perform and sound in comparison with Wharefedales in this setup. I already knew due my experience that LS50 are very sensitive what you pair them with so there was no surprise for me that they really didn’t pair well with this class D amplifier. But on the other hand with Wharefedales this amplifier sounds absolutely marvelous. I have had them in a setup with Sanskrit 6th and tried also other DACs I had available and it just worked really well and the sound was detailed and pleasing. SA98E with its brother audio DAC Sanskrit 6th which is a perfect pair to this amplifier. You might be wondering. After all I have said. The huge distortion this amplifier has (at the end of its power delivery). The lack of musicality class D suffers from and other. After all. Do I recommend this amplifier? Well I believe always better to say to whom. This amplifier is a great budget option if you desire or need a big power and if you are looking for an amplifier on a budget. My opinion is. Don’t go for a little power or for enough power you need due specs of your speakers. I think your intention, priority and thinking should be. “I want a clean sound ” and then if you don’t have another option than go for big powered class D amplifier as this one. This amplifier is quite clean in its half level of power delivery and benefits due class D architecture that it will not overheat even in summer time and can be great for long time listening sessions.